Bad policy or badly implemented? Sarah Smith explores what went wrong with the Poll Tax. Have lessons been learned or is Universal Credit a repeat of history? From the sounds of protest songs to clashes on the streets, the so-called Poll Tax is widely regarded as one of the big political missteps of the 20th century. 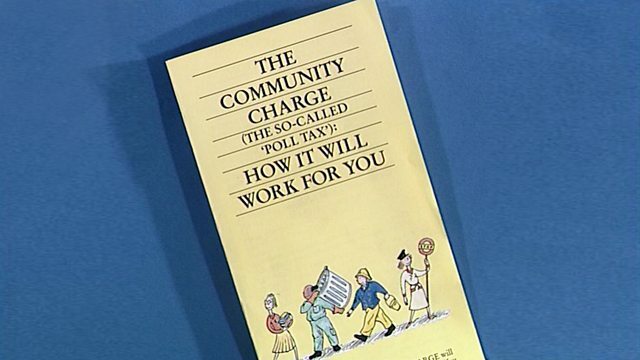 Formally known as the Community Charge, the tax was one of Margaret Thatcher’s flagship policies - and one which contributed to her downfall as Prime Minister. Now, 30 years on since the introduction of the tax in Scotland, Margaret Thatcher's successor John Major has warned that Universal Credit could cause the same sort of problems for Theresa May's Government. Lord Michael Heseltine who brought down the policy and Margaret Thatcher with it. How do they look back on the policy and how it was implemented? Sarah also talks to campaigners and policy-makers about whether lessons have been learnt from the Poll Tax, or if Universal Credit is falling victim to the same mistakes.